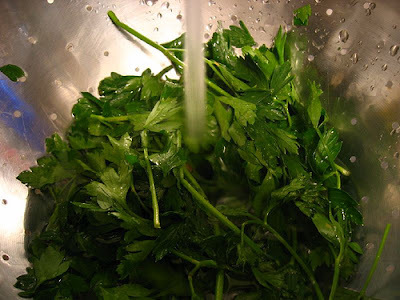 Today we’re going to start a two part series on the merits of using fresh herbs--like parsley, mint, cilantro, dill and chives--in your cooking. By using these often overlooked and underappreciated ingredients, you can take your cuisine up several notches in sophistication, subtlety and healthfulness at a minimal extra cost. A large bunch of parsley costs roughly 99c in a typical grocery store, and most other herbs and greens are priced similarly. For years I would pooh-pooh using herbs like these when I saw them called for in a recipe. 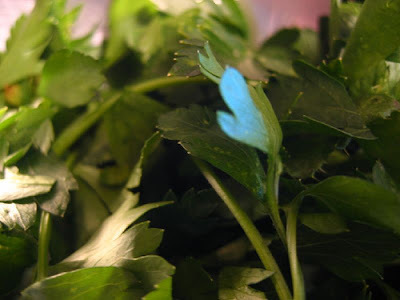 If I saw a recipe that included fresh parsley for example, I’d either consider it an optional ingredient and leave it out, or I’d (shudder) use dried parsley from my spice rack. Oh, the foolishness of youth! The errors of my ways sprung from two serious flaws I had back then (yep, I only had two flaws). First, I was habituated to foods with high sodium content, so I had a desensitized palate that lacked the ability to appreciate these subtle-tasting herbs. Second, I foolishly considered buying fresh herbs wasteful. I'd end up using just a fraction of what I bought and let the rest go to waste. I'll address that issue later in Part 2. Today, I will cover the use of these herbs in the context of improving the subtlety and quality of your cooking. We’ll talk about how the inclusion of simple and inexpensive herbs can make your food smell and taste surprisingly exotic, and we’ll talk about how our efforts over the years in reducing our sodium intake ultimately enabled these herbs to be powerful flavor-makers in our kitchen. Now, our cooking tastes better than ever to us, which of course makes it all the more fun to cook. Free Yourself From the Chains of Salt! Close readers of this blog know that using excessive salt is the worst form of cheating. Face it: it’s unhealthy (and for some people even dangerous) to consume too much sodium. Even more discouraging, a palate habituated to salt and salty foods simply cannot appreciate mild and subtle tastes. Why did parsley taste like pointless nothingness to me years ago, such that I thought nothing of considering it an optional ingredient? Why does it seem like such a powerful and fragrant ingredient now? It all stems from our efforts to “stop cheating” and ruthlessly exclude salt from our diets. What happened to us will happen to you: once the added salt wasn’t in our food drowning out everything else all the time, our palates gradually grew to recognize and appreciate subtler tastes. It’s analogous to being at a bar where the music is so loud that you can’t hear the voice of the cute girl (okay, or guy) you’re trying to pick up. Only after somebody turns down the music can you actually engage with the other person. Food works in a similar way. Certain flavoring agents, like salt, sugar, high-fructose corn syrup, etc., are simply too “loud.” Salt is of course widely overused in all sorts of prepared foods, and sadly we’ve often found salt audaciously overused in some of the most expensive restaurants in New York. Shameless. Phew. Okay. Back to being subtle. One of the key purposes of this blog, above and beyond sharing cooking knowledge, advice and recipes, is to show that it can be fun and easy to cook healthy, interesting meals for you and your family. What's made cooking more fun for us in recent years is re-discovering ingredients like fresh herbs and greens that we can combine with other everyday ingredients in creative, and even exotic, ways. Get the salt out of your diet and watch how these herbs stimulate your palate. Use fresh herbs. Look for recipes that call for them (I'll share several in Part 2). Think of what they'll add to the freshness, subtlety and flavor of any dish, for a mere 99c! That is a laughably cheap price to take the sophistication of your cooking up several notches. And if you succeed in breaking the salt habit, you'll not only enjoy food more, you’ll save a fortune down the road on high blood pressure meds. 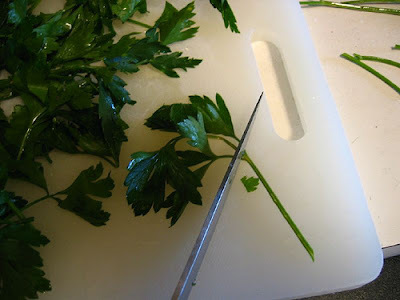 I’ll leave you with some pictures and brief advice on how to deal with fresh herbs by showing the prep work behind the fresh parsley we used in a dish we made the other weekend. It was another home run recipe from my new girlfriend Daisy which I’ll be posting shortly. The next step is to de-stemify these guys (that’s a real word). Note that for some soups, especially the ones we often talk about in Jay Solomon's Vegetarian Soup Cuisine, you can speed up your prep time by skipping or being haphazard with this step. That’s it! Easy to prepare. Check back soon for Part 2, where we’ll solve the waste issue once and for all, and share a variety of sample recipes where you can put these herbs to work.